Last night, New York's Astor Center played host to an event entitled "Gender Confusion: Unraveling the Myths of Gender in the Restaurant Kitchen," in which culinary glitterati were presented with dishes and asked to guess whether they were made by a man or a woman. 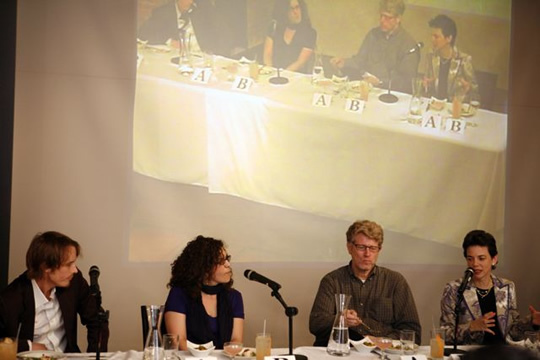 Moderators Hugh Merwin and Tejal Rao hosted an impressive panel of palates that included Alinea chef Grant Achatz, Food & Wine editor-in-chief Dana Cowin, cookbook author Gwen Hyman, and Serious Eats' Ed Levine. The panel was presented ten courses in sets of two, one made by a man and one by a woman. They tasted both dishes before discussing their thoughts with the audience and casting their votes for the chefs' genders. After the panelists stated their predictions, the chefs of each course were revealed, and they came out to discuss the results, introduce themselves, and answer any questions. Off the bat, Achatz voiced an opinion that the chefs were out to get them: "I'll be curious to see if the male chefs try to make a feminine dish to try and trick us and vice versa." His opinion was almost unanimous across the panel, who were convinced they'd see dishes dominated by ingredients and colors with a strong gender association — manly bacon, or bright pink garnishes. 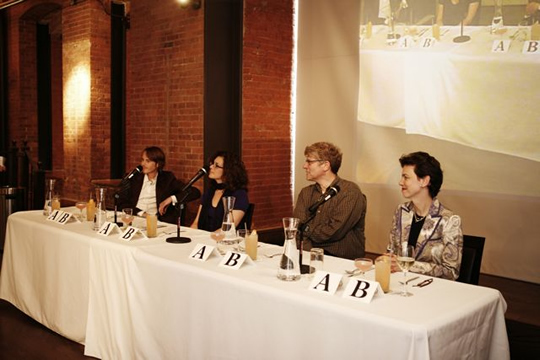 The panelists wound up not discussing every course, but there was some strong opinions: for Course 3, the entire panel thought that a female produced A, and a male B; for Course 4 Corwin and Levine predicted that A was a male and B female, while Hyman and Achatz agreed on the opposite. Dish B of Course 2 included shaved asparagus, and Hyman predicted that a man had made the dish, since men love toys and shaving asparagus involves using a mandoline. In an absolute give away, Iuzzini presented his signature "Dessert Fourplay." Although the panel sort of gleefully accepted it, I feel it took away from the entire purpose of the experiment. Did no one tell him what the event was about? A recurring idea brought up by the panel was that it's personality, not gender, that set one dishes apart from another. Hyman expanded on this towards the end by stating "The greatest chefs are the sum of their experiences - you are who you are, and most importantly, that's what should be brought to the plate." 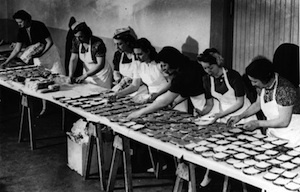 Hyman turned to mentioned some very old cultural stereotypes, "Women cook with the heart, men cook with the head — because women have hearts and men have brains." Of course, no forum discussion could take place these days without the mention of Alice Waters — and after Merwin quoted something long and confusing from her, Hyman quipped, "What does that even mean?" He admitted, he wasn't sure himself. 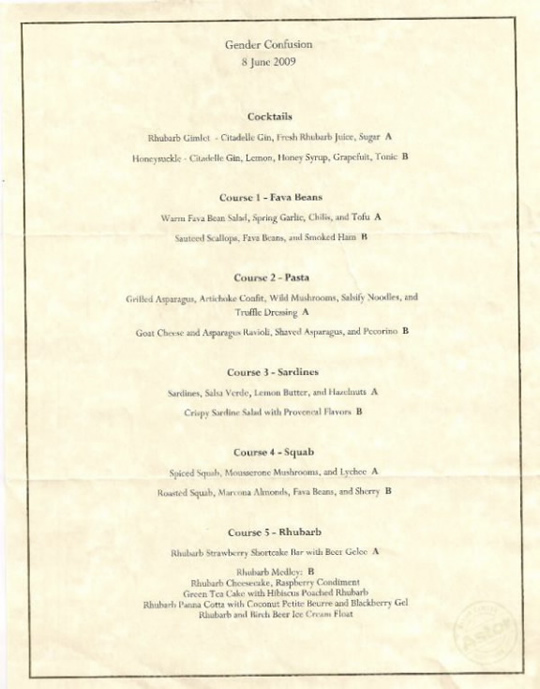 And the mention of Alice gave rise to an interesting tangent about how Achatz might have developed differently as a chef had his California training involved working for Waters at Chez Panisse instead of Thomas Keller at the French Laundry. He admitted, " I would expect my personality would have changed drastically and therefore my cooking as well." Hyman added, "Your mentor can make such a different in the way that you cook. If Mario Batali learned to make pasta from a Grandma in Italy (which he did) then he might have a light hand – and then if Anne Burrell learned from Mario, then she might have a light hand. Mentorship plays a key role." For all the interesting conversation, watching people eat and talk about food (and not eating the dish yourself) for two hours isn't easy on the audience. There was a lot of "dead air" to fill between courses, filled awkwardly with readings of long passages from Gastronomica articles. As a direct result of this, much of the audience left before the end the discussion — by the end, the entire front section (with the exception of Gourmet contributor Francis Lam) had gone off to find something to eat. By a man or a woman, presumably they didn't care. 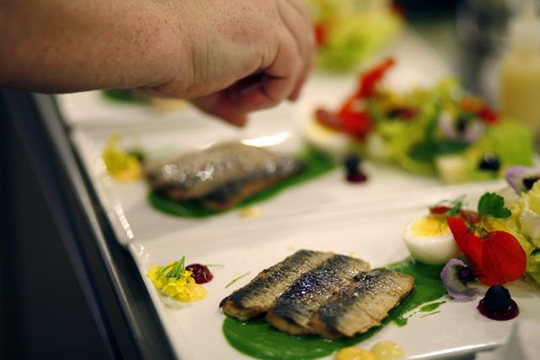 The following is both the results of the gender of each dish, as well as which chef created it.